We are very happy to share with you one of our recent Hawaii wedding videos from a wonderful wedding on Oahu. This lovely bride and groom from the land down under, Australia, were married in an outdoor ceremony on the Halekulani Hotel Hau Terrace overlooking Waikiki Beach. The warm blue ocean and the iconic Diamond Head made a stunning backdrop for this Hawaii wedding ceremony. To top the gorgeous views, the ceremony trellis was adorned with hanging crystal strands and hanging glass vases with white orchids. So romantic! With out further adieu, here it is! 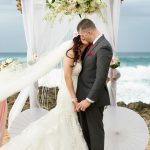 If you were feeling inspired by this wedding video and your wedding planning wheels are turning in your head, we have shared some of the Hawaii wedding details that helped make this wedding so wonderful, well you know, aside from the sweet bride and groom and all of their loved ones! The bride wore a full and layered wedding gown by Maggie Sottero Haute Couture with a crystal covered hair piece to accent her side up do. The Oahu wedding venue where the ceremony and reception occurred was the Halekulani . The bridal party also got prepared for the big day with hair and makeup in one of the suites in the hotel. 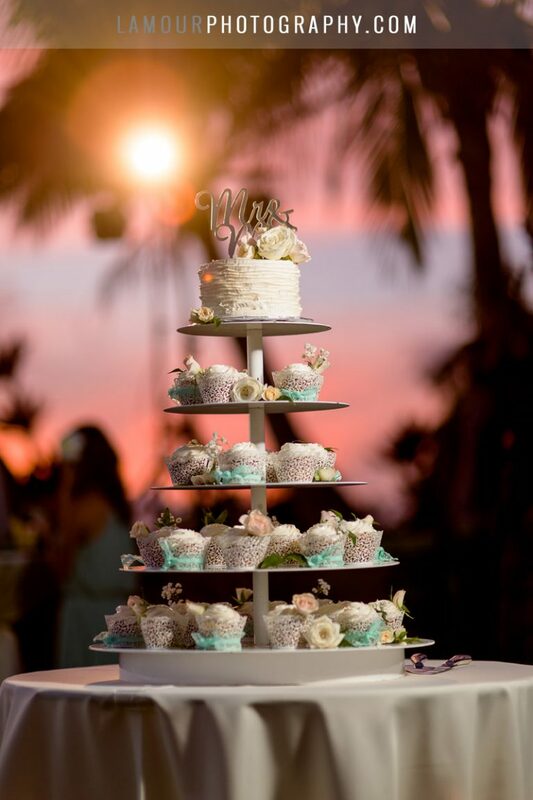 This Waikiki hotel has been in business for over a decade and has superb service, not to mention some of the best food and desserts we have tasted at any wedding in Hawaii. That is saying a lot! The wedding reception featured crystal candle holders with tea lights for a romantic feel and a centerpiece of orange orchids. 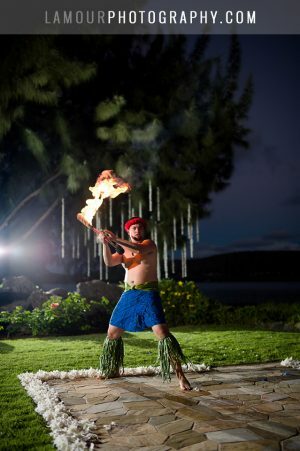 Hawaii wedding DJ Tony So got the party started while Australian wedding planners from Wedding Destinations kept the whole wedding day running smoothly! We hope you enjoyed this video as much as our team at L’amour Photography and Video enjoyed photographing and filming it! Stay tuned for a blog of the wedding photography highlights. Mahalo!